Nobody deals with more STUFF than an Owner Operator. We get it. Pays for itself in the 1st year! 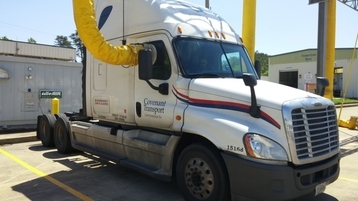 IdleAir provides America’s hard-working long-haul truck drivers an alternative to idling their engines during rest periods. IdleAir service allows truck drivers to turn off their diesel engines and APU’s and still enjoy heating, cooling, standard electric inside and outside the cab, Satellite TV, Internet, and many of the comforts of home — all while saving money and getting better sleep without the noise, vibration, and exhaust fumes from idling. Install the removable window adapter. Lock the interface into place.